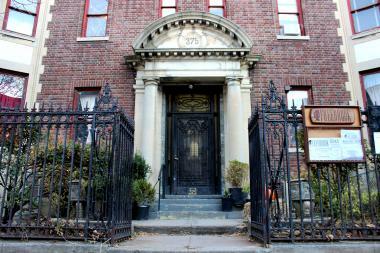 Businesses are moving back into the 375 Stuyvesant Ave. mansion after a fire in May. BEDFORD-STUYVESANT — Businesses that used to be housed in a Bed-Stuy mansion that was badly damaged in a fire in May have started to move back in. Both Ancient Song Doula Services and central Brooklyn nonprofit the Brooklyn Movement Center recently returned to their offices in the 375 Stuyvesant Ave. building after the fire started in the cafe Bread Love and spread to the rest of the building, representatives from both organizations said. "We're back in the space and we're working with the community and the owner," said Ancient Song founder Chanel Porchia. "Things are great." Ancient Song celebrated its grand reopening on Tuesday with accupuncture sessions, henna art and chair massages and begins its bi-weekly infant feeding group on July 17. Meanwhile, the Brooklyn Movement Center began to move back in on June 23, a staff member confirmed. But the fire, which started at 3:30 a.m. on May 14, did take a heavy toll on the building. The interior of the rear stable, which housed Bread Love, was completely destroyed and many of the building's windows were broken as first responders battled the fire, tenants said. Bread Love's owners said previously they do not expect to be able to move back into the building. Complicating matters, the mansion's former caretaker transitioned out of its role late last month. The returned tenants are now working directly with the building's owner, Barry Shepherd. In its latest newsletter, the Brooklyn Movement Center said it would work with Shepherd and his family to help the building bounce back. "As the first tenants of 375 resume full-time operations, BMC is committed to working closely with both our neighbors and our landlord, the Sheppard family, to recover from the fire," according to the group.